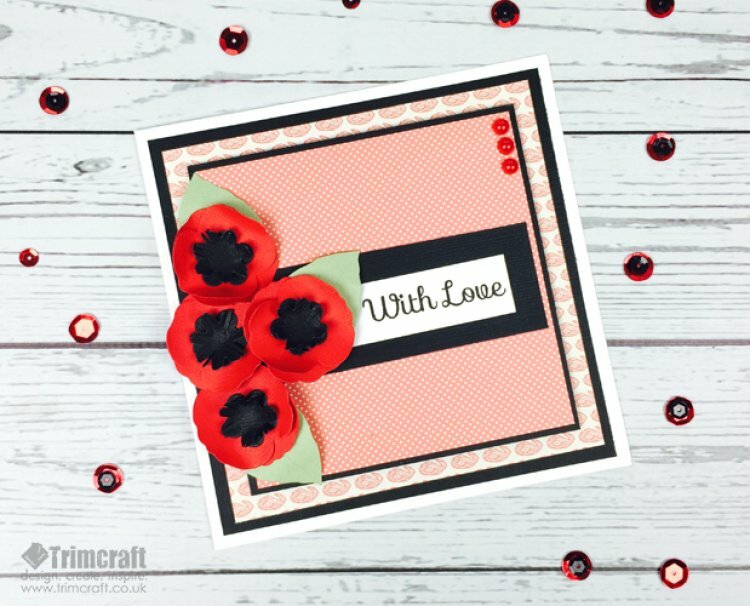 Poppies are the iconic flower for November as we commemorate and reflect on the fallen soldiers, these beautiful flowers make for a great centrepiece for your autumn craft projects. 1.Die cut 8 flowers from a sheet of red textured card; the pansy shape will make perfect poppies. Use a pokey tool to shape the flowers, layer 2 together to make each flower. Die cut the two smallest flowers from black card, cut into one of the flowers to fray the petals then layer on top of the other. Add to the centre of each poppy. Die cut a leaf to add to the back of each flower. 2.Cut a piece of black cardstock to 14.5cm square, adhere to the card, layer with a 14cm square of Neroli backing paper. 3.Cut a piece of black cardstock to 12cm square, layer with a piece of red polka backing paper and adhere to the card with foam tape. 4.Add a piece of black card cut to 10cm x 3.5cm stick to the centre of the card, layering with the stamped sentiment. 5.Glue the poppies in a bunch on the left hand side of the card and add some pearls in the top right corner to finish. This card is perfect for giving to loved ones in November for a different effect try cutting the flowers from felt; you can create variety of projects using poppies. Share your poppy projects with us in the project gallery.